DUESSELDORF: Tyson Fury defeated Wladimir Klitschko by unanimous decision Saturday to end the Ukrainian’s 9-1/2-year reign as heavyweight champion and fulfill his father’s prophesy from the day he was born. Born three months early and weighing just one pound (.45 kg), Fury wasn’t given much chance to live, but John Fury told doctors it was his destiny to live and become heavyweight champion of the world. He named the second of his six sons Tyson, after Mike Tyson. 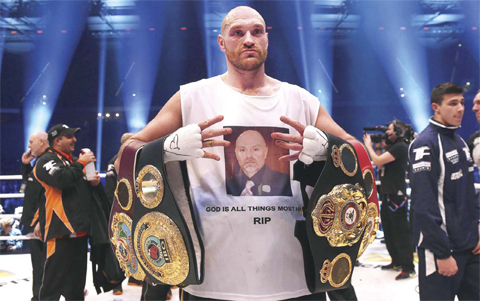 Twenty-seven years later, the 2.09-meter (6- foot-9) Tyson Fury, who is of Irish-Gypsy heritage and comes from a bloodline of bare-knuckle champions on both sides of his family, finally lived up to his name. “It’s something I’ve been working on for my whole life,” Fury said. “I’m bred to be a fighter.” After a bruising encounter that ended with cuts near both of Klitschko’s eyes, referee Tony Weeks went to the judges’ scorecards. Cesar Ramos and Raul Caiz Sr. scored it 115- 112 each, while Ramon Cerdan had it 116-111 in favor of the undefeated Briton (25-0, 18 KO). Klitschko (64-4, 53 KO), contesting his 28th title fight, was cautious until attempting a recovery in the final rounds, but suffered his first defeat since April 2004. “The speed was missing. Reach played a big role. I tried but it didn’t work,” said Klitschko, who at 1.98-meters (6-foot-6), was in the unusual position of facing someone taller. Fury, who weighed in at 112 kilograms (247 pounds) also had half-kilo (1.1 pound) weight advantage. “I saw my face in the mirror and it didn’t look so nice. But that’s boxing,” Klitschko said. Klitschko, the premier heavyweight of his era, relinquished the IBF belt he had held since 2006, the WBO title he’d owned since 2008, and the WBA crown he’d had since 2011. The other major belt, the WBC title, was held by Deontay Wilder of the US That was vacated in 2013 by Klitschko’s older brother Vitali, the current mayor of Kiev, Ukraine. The buildup to the fight had seen Fury dressing as Batman and serenading and insulting Klitschko, and even complimenting him on his scent. “I’ve said some stupid things,” an emotional Fury said of his pre-fight talk and antics. “Wladimir, you’re a great champion and thanks for having me. It was all fun and games in the buildup.” Earlier Saturday, Fury threatened to call off the bout unless an issue with the canvas being too soft was resolved. There were also issues over gloves and glovewrapping. Vitali Klitschko oversaw Fury’s glovewrapping, but the Fury camp was incensed when the younger Klitschko wrapped the gloves without any of them present. That spat was resolved when he agreed to re-wrap.